Ocean Dreams, with three bedrooms, is suitable for up to six people in total comfort. 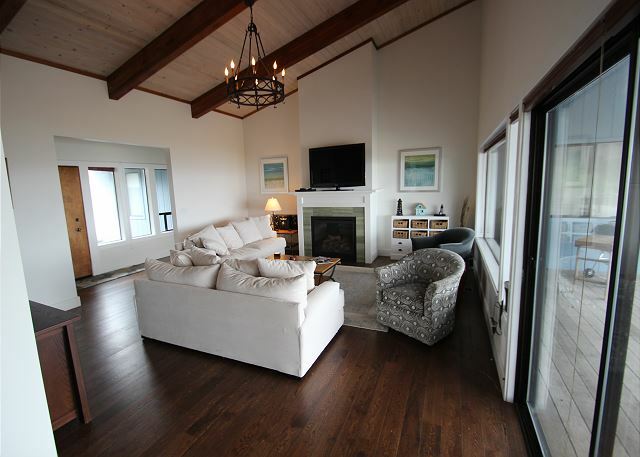 Enjoy the cozy living room in front of the gas fireplace and large picture windows for views out over the cove, the ocean and to the Point Cabrillo lighthouse. The formal dining room has its own view windows with open space to the large kitchen with all the necessities. Take a walk through the pleasant neighborhood (it's just a half-mile to the Caspar Beach). Get sand between your toes and watch the waves wash in to the shore. On top of that, the little country store at the beach rents paddleboards, surfboards, kayaks and more. The deck offers views of the ocean and lighthouse at any time of the day, of course, but it's the favorite spot for many in the evening. It's hard to beat the combination of a nice wine and a lovely sunset....To see all photos and details visit our website. Please note: Children under the age of 8 years are not permitted due to close proximity to the bluffs. Been in this house now 4-5 times. And the neighborhood maybe 15. Great area and terrific views. House good for couple or family. Only one shower that is available. This house has evertyhing except more than one shower! We knew about the one shower before booking and the six of us made it work. 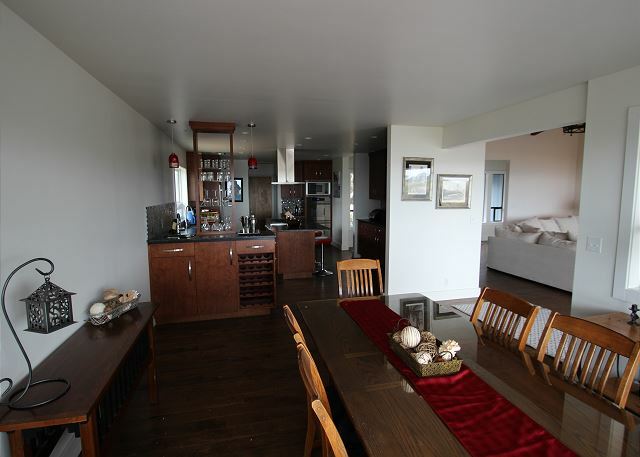 The house is very comfortable, has a gourmet kitchen, and stunning views. 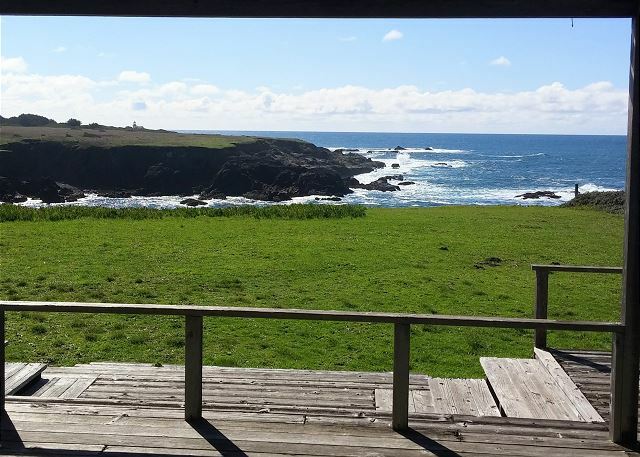 The location is perfect both for oceanview and the close proximity to Mendocino and Ft. Bragg. The property management company was great to work with too. The fireplace was not operational while we were there and the property management did advise us of that ahead of time. We all had a wonderful time! 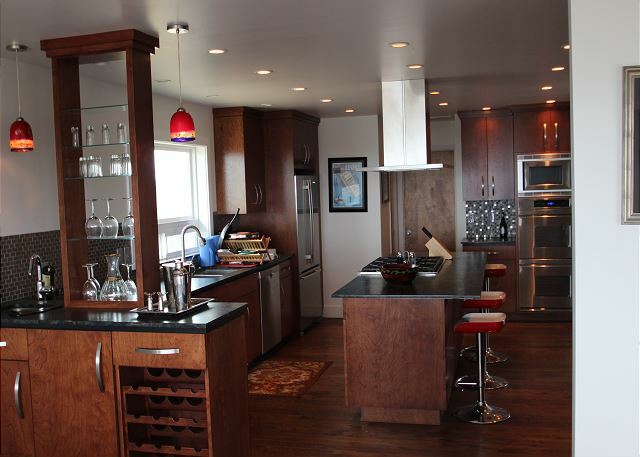 This is a beautifully set home on the bluffs of Casper. We have stayed here 3 times now and love it!. The beds are comfortable with each room having a King? There are hiking trails near by and the light house. It has a large front yard a plenty of parking. It is becoming our home away from home for sure. There were just a couple things regarding the hot tub and the back slider door and hopefully they will be taken care of. Love this Home! This home needs further updating. It only has one shower for the entire 3 bedroom home and it needs to be updated. 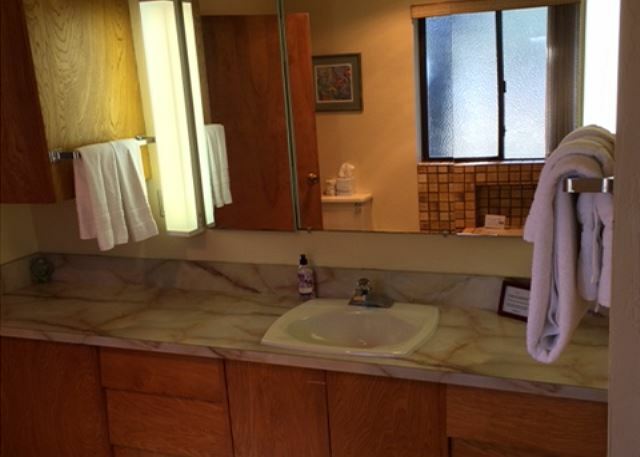 The master bathroom is right out of the 70's. The wrap around deck needs to be repaired as well. 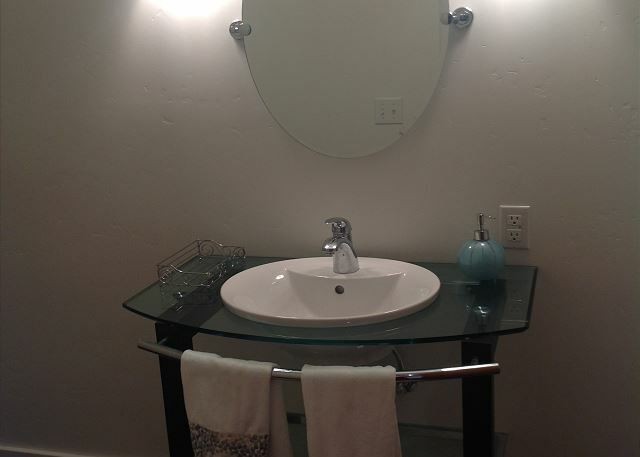 Given the price, we would expect the bathrooms to match the rest of the home which obviously had been updated. Great house with a cozy family room and fantastic kitchen! The house only has one shower, which is the only draw back. I loved the location and the view! Third or fourth time in this house. Great for 2, still only one shower. This property is spectacular in every way. The home is beautiful and the views are incredible ocean front with the waves crashing and the lighthouse shining. 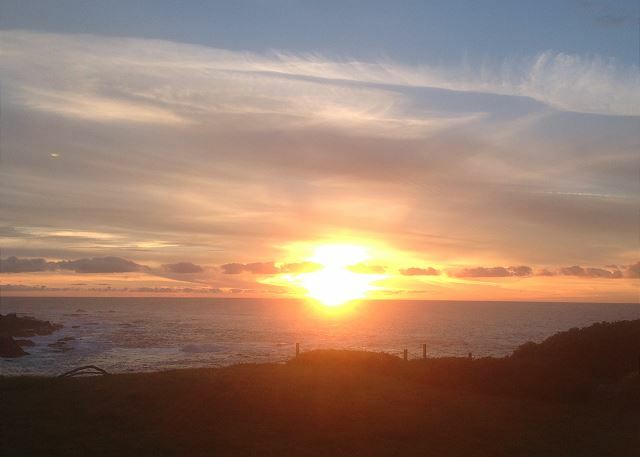 The location is close to Mendocino and Fort Bragg and walking distance to Caspar Beach. Our dogs loved the walks in the neighborhood to see the sea lions barking on the rocks. Deer visited the front and back yards along with a great blue heron. We will return and recommend to friends. Loved staying at Ocean Dreams! The view and the space are exceptional. We will be staying her again. Out of all the pluses like the ocean view, the modern kitchen the cozy living space furniture, the front yard for our pups! there were just a couple things that may bother some, we got over them. 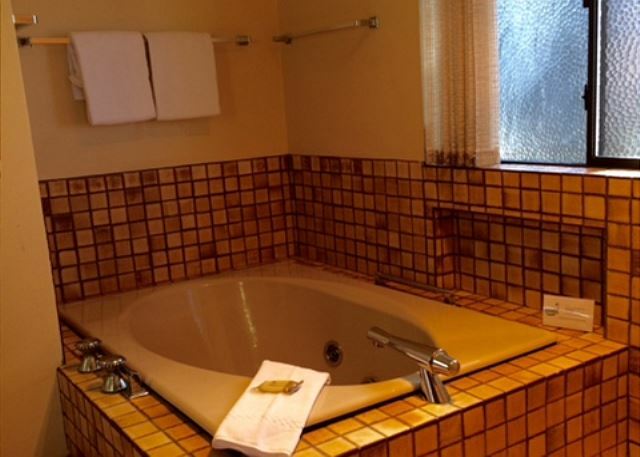 Them Master Bed Bath only has a soaking tub and is very dated but clean and operational. The other thing is the light house beam comes into the rooms at night so close the curtains as tight as you can. It flashes every 8 seconds. I am a very light sleeper so this was just a little bit irritating, I had to sleep with my back away from the window. This does not happen if it is foggy :). We have stayed in quite a few of your rentals and have found joy in them all. This house was at the top of the list! The most well appointed kitchen yet and we love to that was nice. The house was very comfortable and the views amazing. The only thing that was disappointing was that there was only one shower. which for two was not a problem but odd for a house that size. We will probably stay here again. The location just doesn't get any better. 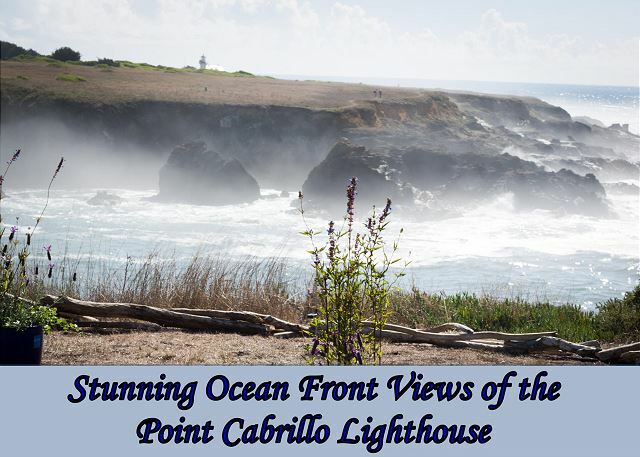 Half way between Fort Bragg and Mendocino and right on the bluff with stunning views of the lighthouse at Cabrillo. The house is also amazing. It has everything you'll need for up to 3 couples to have a thoroughly relaxing time. Somewhere By the Sea, Ocean Dreams Waits for Me! We stayed at Ocean Dreams from 8/5-8/12. Beautiful views of the ocean and Cabrillo Lighthouse. We ate all of our meals in the home as the kitchen is well appointed. Bring extra paper towels! The hot tub was tricky getting in and out of, a hand bar on the post would help. We saw whales, a fox ran by the deck, lots of deer, and the gulls like bread! The hike to the lighthouse is about 1 mile - an easy hike. Beds were comfortable. Only draw back was 1 shower for 5 adults. We walked mostly at the Headlands (first left over the Noyo Harbor Bridge). We saw more whales and seals, deer, an Osprey with a fish, a bald eagle, and human animals. Very relaxing week and worth every dollar spent! 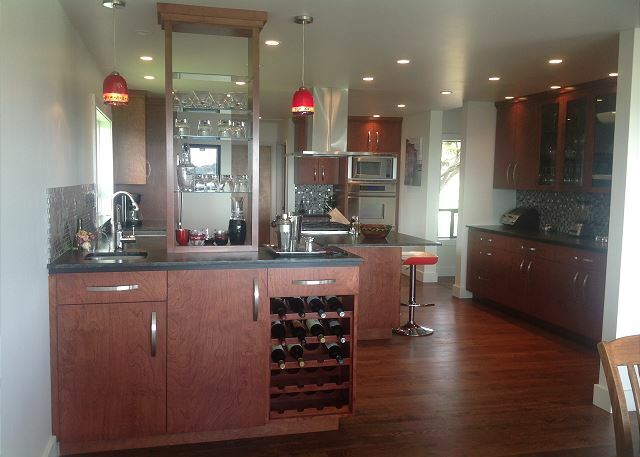 Wonderful location/views and amazing kitchen! We are repeat Mendo Preferred renters but this was our first time in this home. I don't have many negatives. Great location in South Casper and the kitchen is stocked with everything you could need to prepare a meal (sans the food). We will definitely stay again! 3 king bedrooms, 3 baths but only 1 shower? Master bath needs a shower! We only used the Master Bedroom but it was extremely dusty. The bedspread was really dusty so we had to take it off the bed. My allergies were having a field day. The carpet in the part of the house that is carpeted (bedrooms), needs a serious cleaning. I believe through cleaning in a house that allows pets, is a must at least once or twice a year. The View Really is that Good! My family wanted to explore a new area, and Ocean Dreams was the perfect place for us. We enjoyed cooking in the best stocked kitchen ever! 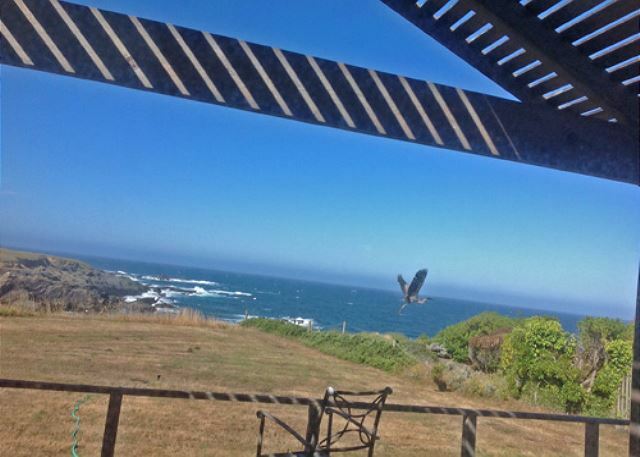 Mendocino was having a fabulous weather weekend. We enjoyed the Little River golf course, and had a nice walk out to the lighthouse. The house was better than advertised. View is awesome. Kitchen is huge with everything you need. Doubt you will be disappointed. One note-master bath is tub only if that is a concern. Lori T from Reno, Nevada does not recommend this vacation rental. The kitchen, living room and view were wonderful! The shower door didn’t close. The master bathroom was very outdated. The master bed was extremely hard. It was an ok property for two but to have three king bedrooms and only one shower was crazy. We were happy it was just us two. Second time in this house. Great for couple or small family. Great location and views. New hot tub. But still only one shower for three bedrooms. Lovely stay for our family of 5, plus our boloved lab, in a comfortable home with breathtaking views. My wife, in laws and dogs loved this property. The house sits in a well maintained, quiet neighborhood. 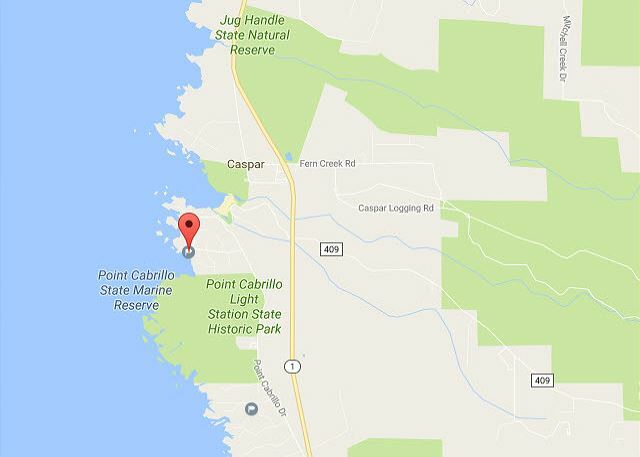 There is access to walking trails to the north and south with the trail to the South leading to the Point Cabrillo Lighthouse. The older members of our party spent their day sitting in the yard overlooking the ocean playing cards building puzzles and talking. We spent our day walking to the trails, using the Jacuzzi, reading and BBQing while watching the sunset. The house is well stocked and clean with plenty of room for the four of us. 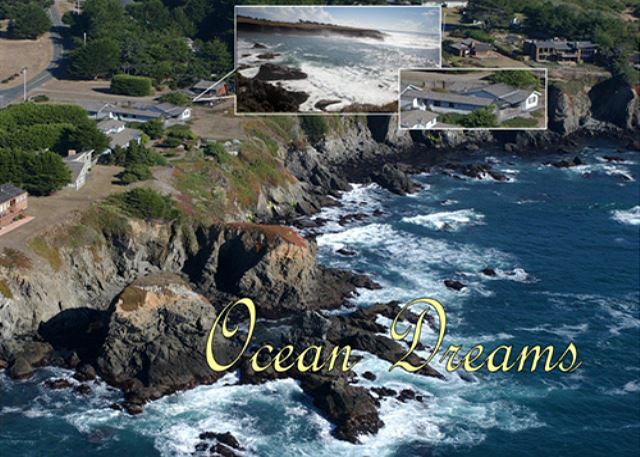 The location is minutes from Mendocino, home to many restaurants. In short, we loved this house. Fantastic!! Great view, and house set up well. The location is great, views are beautiful and the house is well appointed. 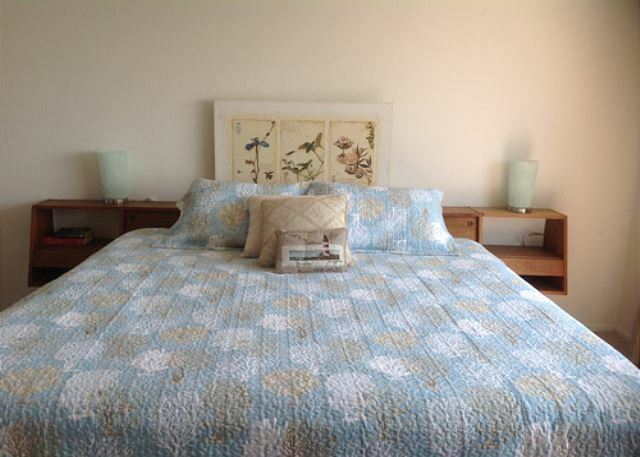 It is very comfortable and can easily accommodate three couples. If you close the driveway gates, you have a large enclosed yard for dogs (as long as they don't jump off the cliff). One minor issue: the spa tub in the master bath is relatively useless as the jets do not operate. It would be great if the owners would pull the tub and install a shower since there is only one shower in the house, which is tough when you have three couples sharing it. I would stay here again in a heartbeat. Other than the single shower and the weakness of the internet signal, it was a near perfect stay. A nice break in winter! Love this house with its views, spacious kitchen, and living room. Wildlife also shows up like deer and foxes in the back and side yards. The hot tub is a good size so you will not be cramped. great house. and amazing location! Very nice stay in Ocean Dreams. Have stayed Mendo Preferred property many, many times. First time this house. Great updates in kitchen, living room and 1 1/2 baths. Need update of master bath. Only one shower in the house. OK for one couple, potential problem for more people. Deck and hot tub also need updates in near future. A relaxing, private home that is away from the noise of HWY 1 but close enough to allow easy access. Enjoyed cooking in the well appointed kitchen. Great indoor and outdoor spaces to relax and watch the sunset after hiking. So, many hikes near by I could name them all here but we were able to visited the lighthouse without even getting in the car using a path from this nice little neighborhood. We have used Mendocino Preferred for many years and as always the management team at was welcoming, courteous, and helpful. My husband and I stayed at Ocean Dreams with our small dogs to celebrate his birthday. It was exactly what we had hoped for -- a restful break from hectic Bay Area life. 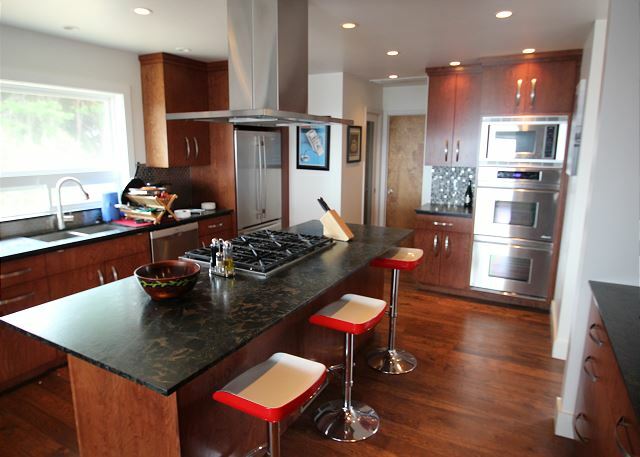 The property was immaculate and had everything you could want in a vacation rental. I enjoyed birthday baking in the gorgeous kitchen. The ocean front views are magical. Add to that the sound of the waves and the gentle turn of the lighthouse and it is truly a one-of-a-kind experience. The house is about 5 minutes to Mendocino and close to Ft. Bragg where we (finally, after many visits to the area) were able to take a ride on the Skunk Train. For dog owners, know that there is no fenced in area and the backyard is literally cliff-side. This was not a challenge for us, but good to be aware of. We'll definitely stay in this home again when we're back in Mendocino. We are a family of 5 with 2 college-age kids and high schooler. The house was big enough to contain all our personalities and the large kitchen was well-equipped to cook a multi-course meals. AND there's that view! Great house, beautiful kitchen, plenty of rpoom, and the views!! Francine W from San Carlos, CA does not recommend this vacation rental. The house was lovely and the kitchen great. It fitted all our needs. However, I left a very expensive pair of pants in one of the bedrooms. I notified to office right away. They didn't respond so then I called. They said they would check with the cleaners. Then I received an email that said the pants weren't found. How can this be? I am very upset about this and probably would not deal with this company again. Linda M E from Cloverdal, CA does not recommend this vacation rental. Need another shower. Furniture was not comfortable for two senior citizens. May I suggest either recliners or chairs with stools instead of couch in front of TV. The reason I would not recommend this property to friends is because all my friends are senior citizens and would have same problem we had with furniture. My friend loved kitchen and gas stove. Lighting in some bedrooms for reading could also be improved. We really enjoyed our stay at Ocean Dreams. The views are stunning. You can tell that the property is constantly being updated. The kitchen is really well equipped. It was interesting that even though there were 2.5 bathrooms, there was only 1 shower. The master bath should be the next update in the home with an installation of a shower. We would definitely stay here again. The property management company was a pleasure to work with and very accommodating. Wonderful house. Very well laid out and the kitchen/dining room/living room are beautifully updated. And the view!!!! From the kitchen, living room and master bedroom is stunning!!! We saw a whale breach the first morning there while sitting in the living room. Nice deck for drinking morning coffee while taking it all in. Best rental I have ever had, and I had some good ones! The kitchen was a chef's dream come true. But I'm not a chef and it took a few days to remember where I found things because there truly is everything you would ever want or need. The view was magnificent! It was really nice falling asleep to the sound of the waves rolling in. On the down side, I had trouble with the hot tub cover since the handle was broken. The management company sent the spa guy over immediately, but there was little he could do with the aging lid. But the view from the hot tub is great and worth fighting with the lid. The gas fireplace was a nice treat. 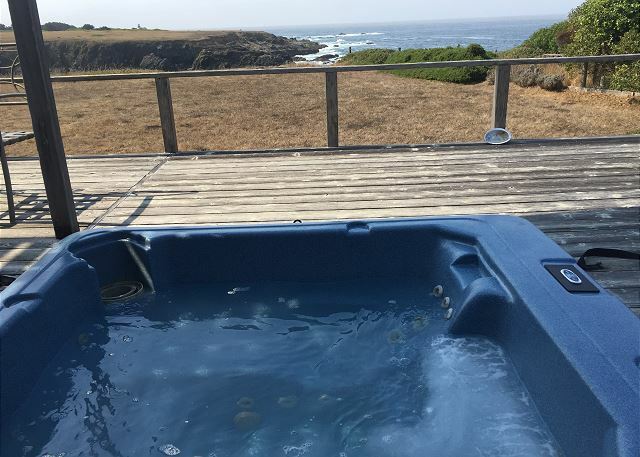 Hello Giselle, we just wanted to let you know that we have a new spa lid on the way so if you decide to stay at Ocean Dreams again you can just relax and not hassle with the lid. We're so glad you had a nice time, thanks for staying with us. I would highly recommend this vacation rental. You can't beat the beautiful location, and amazing view from most of this house. This was our second stay at Ocean Dreams. Our first stay I had a couple issues and dealt privately with Preferred, those issues were resolved for our second visit. We have rented through Mendo Preferred before and are very happy with them as well. By far my favorite rental so far and we have been renting homes in Mendocino for about 8 years now. Bluffs to hike on the beautiful Caspar beach a reasonable walk and 1 min drive. Can't say enough good about our stay. The house was spotless! Thank you to the owners for sharing this home. 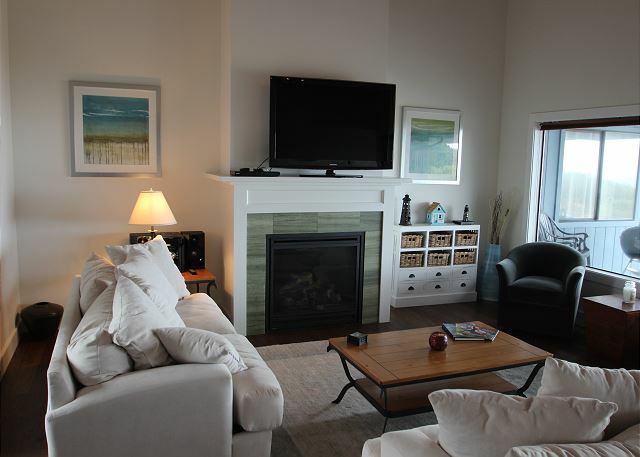 Ocean Dreams is one of the best vacation rentals we have experienced. The house has everything, most things work well and the location is hard to beat. We will definitely be back. Ocean Dreams was our ocean dream! 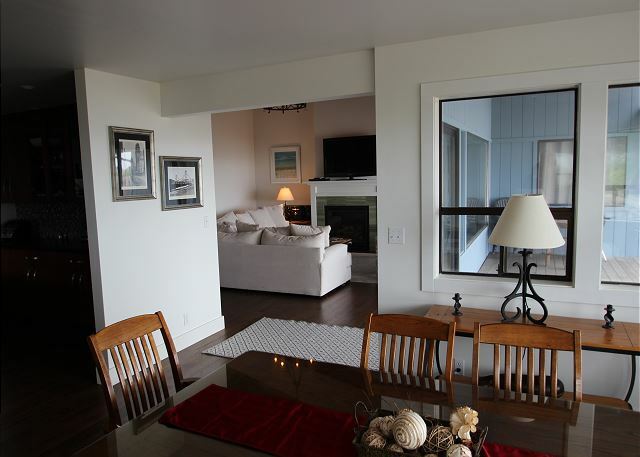 This home was just beautiful with a lovely unobstructed view of the ocean. The kitchen was well appointed and we found ourselves cooking in more than we planned so we could just enjoy the view. Mendocino Preferred was wonderful to work with. Check in and check out was simple and painless. We notified them on the first day that the spa was not working. They had it repaired immediately. I asked if they knew where I could get a shower chair for my husband and someone in the office loaned us their personal one and delivered it!! We would rent from them again without any hesitation. My husband is disabled. This is a perfect property and surrounding area for him. Great flat area and the beach is a short walk away. Great experience. This is a beautiful home overlooking the cliffs on the ocean. It was peaceful and relaxing, and had a great kitchen to cook and enjoy meals. It's a short distance to Mendocino shopping- very convenient! We loved it! The neighborhood is great and location is close to a trail which was a define plus. The living room kitchen area was wonderful, however the rooms and bathrooms need some major renovation. Plus there was only one shower, the other bathroom had a tub and no shower so it was difficult to shower and we all had to take turns. There were also so many rules in the house (notes everywhere) which definitely didn't make you feel welcome. I also needed to do laundry as we had our baby with us but there was no laundry detergent. There are no blinds so we woke up with the day light although we wanted to sleep in. Overall we loved the area but we would stay somewhere else next time around. We give it 3 stars over 5. All is tidy ! So we are very satisfied ! Fabulous. I would like to come back right now! The location/views are spectacular. The house is well-appointed and comfortable. We encountered a few minor problems. The hot tub did not work over the ten days we were there. The gas fireplace did not work for two of those days. The WiFi was intermittent and didn't reliably reach all parts of the house. Overall, it was a lovely stay. Good trip. Been using Mendo Prefered for all are Mendo trips. Beautiful Homes and Pet Friendly. Only thing throw rug in living room needs a shampoo. Thank you for a great vacation location. The rental was everything we could have wanted. The the property was as advertised with great views and perfect amenities. The customer service and staff interaction was excellent. I would recommend the property to everyone and hope to return to the same property soon. A gorgeous property. Wonderful kitchen. Comfy hot tub! Highly recommended. Location is gorgeous. Views alone just make you happy. House is beautiful and area is peaceful. 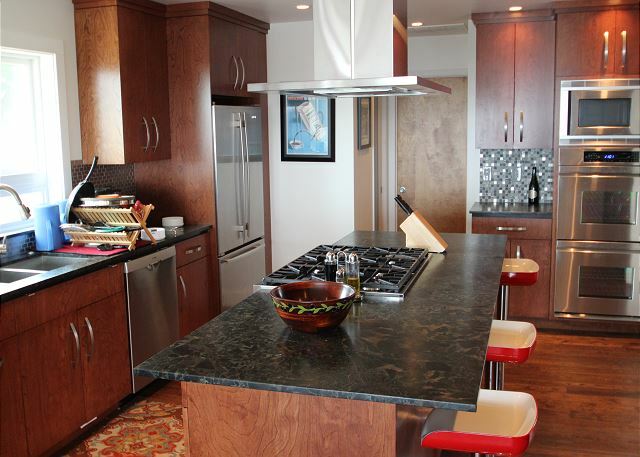 Main living areas are upgraded with a gourmet kitchen fully appointed. Two of the bathrooms have been upgraded. Needs one more shower which I'm sure they will be doing in future upgrades. All of the house is spacious and welcoming, clean with comfortable beds. So much good to say about it I can't get it all down here. We had a great time. Great walks along bluffs to the lighthouse. Favorite restaurants this trip were The Restaurant and Mendo Bistro both in Fort Bragg and the Flow in Mendocino, as well as the Café & Bakery on Lansing In Mendocino. We had friends with us and plan to stay here again. Just a lovely place. This was the perfect house for a relaxing weekend on the coast. The house was well stocked with kitchen utensils and appliances. The bedrooms were spacious and comfortable. The deck/backyard was perfect for our dog to have some time to run around. Overall we had a perfect weekend on the coast!